London Millennium Footbridge in Dec. 2014 (Photo by Emily Caldwell)When participants in a charity event took the first walk across the newly opened London Millennium Footbridge in 2000, their feet fell into sync, and the natural side-to-side motion of their steps caused the suspension bridge to sway. That’s the physics of what happened that day, but a study at The Ohio State University is trying to explain the human side of the phenomenon: Why—consciously or unconsciously—did people fall into the same cadence, and keep walking that way, even as the bridge swayed beneath them? The swaying unnerved many of the walkers that day, causing officials to close the bridge for two years to make modifications. But the walkers did it to themselves, because walking on a swaying surface saves energy—about 5 percent—compared to walking on a stationary surface, said Manoj Srinivasan, assistant professor of mechanical engineering and director of the Movement Lab at Ohio State. “What we found is that when there are only a few people on the bridge, it’s energetically optimal to walk without shaking the bridge. And if there are enough people on the bridge, it is better to shake the bridge, and thereby lower your energy costs,” Srinivasan said. The study appears in the February 2015 issue of the journal Proceedings of the Royal Society A. Before engineers added dampers to the bridge and re-opened it in 2002, the structure had a certain “springiness” to it, not unlike a treadmill, he explained. But unlike a stationary treadmill, the bridge was able to swing side to side on its steel cables. Something about that situation encouraged people to walk a certain way. Enter Srinivasan and his team, who are trying to develop a complete theory of legged locomotion to explain why people walk the way we do. Stability, of course, is a primary concern when we walk. But beyond that, research in the Movement Lab is showing that people’s next top priority appears to be conserving energy, regardless of the situation. It’s an effect that he and his colleagues have begun to jokingly call “the principle of maximum laziness.” People tend to adjust factors like cadence and the length and width of their strides if doing so will save even a tiny amount of energy. Ultimately, Joshi and Srinivasan would like to test how people move on a swaying surface in a laboratory setting, though that would be challenging to set up. But for this analysis, they created a computer model to do the same thing—a simplified human body walking on a flat surface. 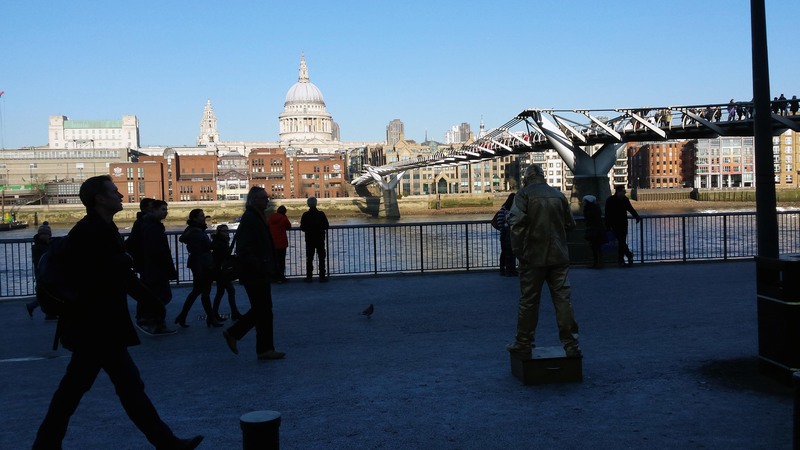 They compared the model walking on a typical treadmill surface to one with the springiness and swaying capability of the original Millennium Bridge design. On the typical treadmill, the model human bobbed up and down as we normally do when we walk. That is how we expend most of our energy when we walk—pushing off from the ground. But on the treadmill that swayed side to side, the model bobbed a little less to achieve the same forward motion, so that less effort was needed by the legs, and about 5 percent of energy saved. The frequency of the swaying and the properties of the bridge have to be just right for the energy reduction to happen. Part of why Srinivasan is so fascinated with the Millennium Bridge debut is that people somehow spontaneously fell into a cadence that created a such a sway, which caused more people to fall into the same cadence, which made the bridge sway more. The people on the bridge that day seemed to widen their stride, unconsciously increasing the side-to-side forces that in turn increased the swaying. “Ultimately, the behavior is probably a tradeoff between stability and energy. Taking wider steps can increase stability, but it turns out that when you’re walking on a swaying bridge, taking wider steps also saves energy,” he said. Much more work needs to be done before researchers can completely understand all the forces that cause us to walk the way we do, but the answers would help with the design of prosthetics and other assistive devices, as well as robots. This work was funded by Srinivasan’s Faculty Early Career Development award from the National Science Foundation.